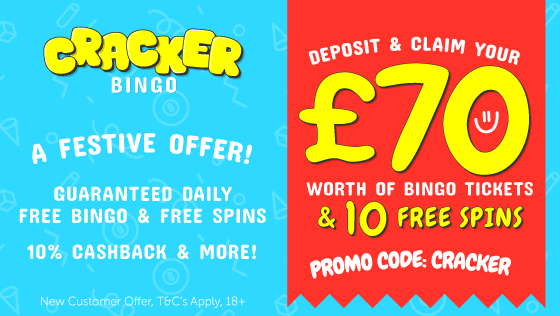 Now everyone who plays online bingo knows the ever popular Costa Bingo, which offers a great choice in bingo games including daily free bingo, lots of free bonus awards, great choice in instant games and much more. Well now, did you know that they have their very own ‘Slots Only’ website and you can get 5 free spins with no deposit required at Costa Games just to try it out! 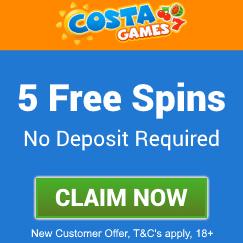 To get 5 free spins with no deposit required at Costa Games you will need to open a new player account, which is quick, easy and only takes a few moments. To start, click one of the claim buttons on this page (top or bottom) and this will open up the Costa Games website in a new tab within your browser. Once on their homepage, just click the big red coloured ‘JOIN NOW’ button to open the online form you need to complete for your registration. You will need to include valid debit or credit card details to get 5 free spins with no deposit required at Costa Games but don’t worry, this is a security procedure and no funds will actually be taken. Now that you have opened your account, you will need to wait up to 10 minutes to receive an email to tell you that your free spins have been added to your account. If you registered using a desktop or laptop computer then you will be able to use your 5 free spins on the Enchanted Prince slot. If you registered using a mobile or tablet then you will get to use your 5 free spins on the Magical Forest slot. When you use your free spins, the minimum win is 10p in bonus funds or a maximum of £5. Any bonus winnings you receive from your free spins will need to be wagered 80 times before they can be withdrawn as real cash. Once you have enjoyed your free spins and want to deposit into your account, Costa Games has a great first time deposit offer which gives you a 100% cash match up to £50 free PLUS you will receive a further 100 free spins! Costa Games is a great slots online website and is brought to you by the same team behind popular online bingo sites such as Sparkly Bingo and Dino Bingo. This means you can expect a high quality of gameplay. 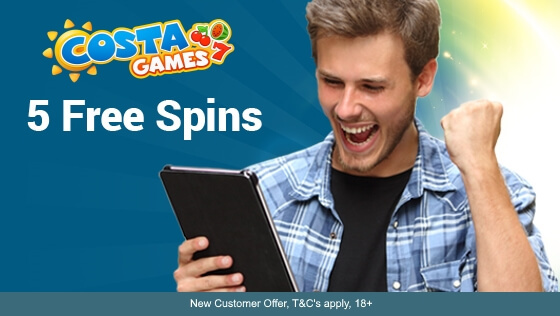 So why not gives those reels a spin, click the button below, join and get 5 free spins with no deposit required at Costa Games today!